Neuheimer Lab alumnus Jennifer Wong-Ala (currently at Oregon State University) will be presenting our work on how life history shapes reef fish settlement off Hawai'i Island. 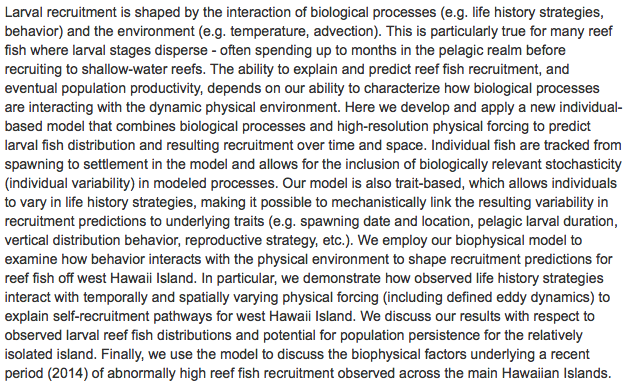 The work, a collaboration with NOAA as well as the McManus, Powell and Hixon labs, explores how biophysical factors shape the ability of larval reef fish to make it back to the reef. Jennifer will be presenting in today's (Monday 12 Feb) poster session from 16:00-18:00. Posted on February 12, 2018 by Anna Neuheimer.